The Hypercom T7P is an integrated terminal and printer, featuring a small footprint that saves counter space and eliminates clutter. 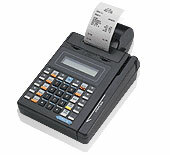 The 35 key keyboard features singlestroke activation for check, debit, void, refund, and many other functions. It is easy to learn and use. The unit has a 512K memory for complex applications and has room for up to 200 transactions per batch. With a dial transaction response time under 10 seconds, the T7P is great for busy environments. There is also a peripheral port for Hypercoms S7 PIN pad for debit transactions. The terminal also features a high visibility 2 line x 20 character back-lit LCD display making it excellent for restaurants and bars where there is not always sufficient light. The clerk-friendly operations make it easy to change paper and ribbons.